Oh, hey! Yeah yeah yeah, I know… it’s been *quite* awhile. More on that later. Let me just PLEASE share this awesome recipe with you. Ten years ago, some lovely person gave us a crock pot for our wedding. It was even on our registry. But it took us ten years to actually use it. JD and I literally wiped dust off of the top of the box. But, when Alice-Anne was born (again, I’ll catch you up later), we were brought two amazing recipes… a beef stew and this sesame chicken recipe, both of which required a slow cooker. We wanted to try making them ourselves and decided to finally take the crock pot out of the box for the sake of yummy grub. In a large bowl, combine onion, garlic, honey, soy sauce, ketchup, vegetable oil and red pepper. Season chicken thighs with salt and pepper, to taste. Place chicken thighs into a slow cooker. Add honey mixture and gently toss to combine. Cover and cook on low heat for 3 hours and 30 minutes. Remove chicken thighs from the slow cooker and shred the chicken before returning to the pot with the juices. Cover and keep warm for an additional 30 minutes. This was just awesome, and I highly recommend it! 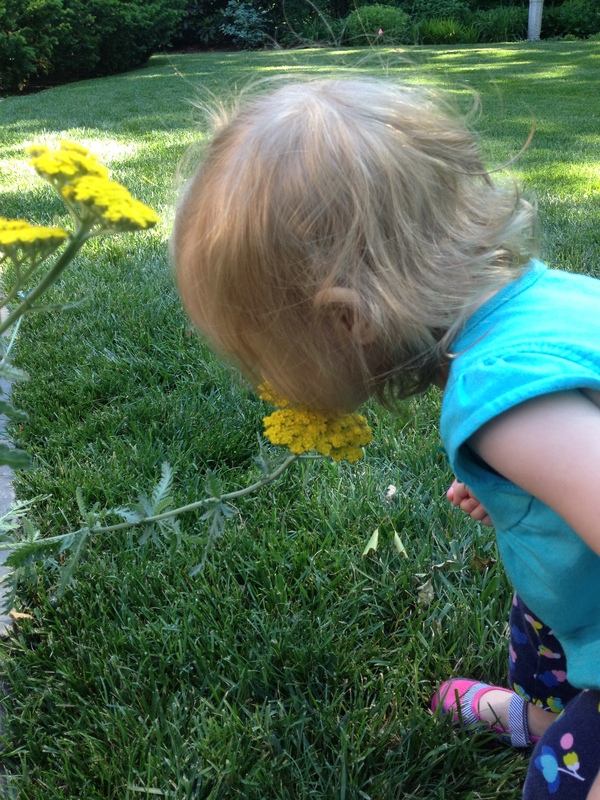 More soon… just taking some time to smell the yellow flowers. I remember the panic… I was in my second trimester pregnant with Maggie, and my mom had said I needed a registry for a few baby showers on the horizon. I didn’t know where to begin, and I was adamant that I didn’t want a lot of “stuff” for our impending arrival. (My baby was going to continue my minimalist lifestyle. I was NOT going to give in to Baby Consumerism!) So I read a few blogs, gathered some info from friends, and sat down with my mom on the couch and started registering. Looking back on that time, I had NO IDEA what I needed. When a girlfriend jokingly g-chatted me the other day, asking me to make her registry for her baby due this fall, I remembered that time in my life where I was panicking about doing this very same thing. So I thought about it and assembled the list below for her. As it turned out, gathering the list came so easily to me. It was fresh on my mind since I was just sorting through things that Maggie didn’t need anymore. The email to my pal became so epic, I decided to share it here with you because perhaps it will be helpful. Of course, I preface this with: everyone is different, has different preferences, wants different things… this is not a commentary on parenting style or even an exhaustive list of everything you may ever need. This is just what I needed and wanted. My only hope is that it provides a glimpse and a skeleton of what you may need if this ever comes up for you! No need to put baby soap, shampoo, or washcloths on your registry… people just get them for you. Rarely will you need lotion, and almost never will you need baby powder. Depending on if you get an actual diaper changing stand, you may not need the changing pad. BUT, we used a very old coffee table and put a chair next to it and that was that. We didn’t want to buy extra furniture. Diaper bag… yeah, use something, maybe a backpack, but this may not warrant a registry item. Pampers and Target-brand diapers were the only brands we liked. You won’t need a crib until maybe 6-8 weeks or so. Until then, you’ll want a bassinette to put next to your bed for during-the-night feedings. Try to borrow this. Otherwise, here’s a good option. Mittens… no kidding around here. Monitor… we decided on a video monitor, and it’s awesome. This is more of a personal choice though. Ours is a Samsung, but you can choose whatever you guys are most comfortable with. The video monitor was by far the registered item I most rolled my eyes at, but JD wanted it. Now that we have it… whoa it is wonderful. I have no clue what I would do without it. Crib… a completely personal choice. 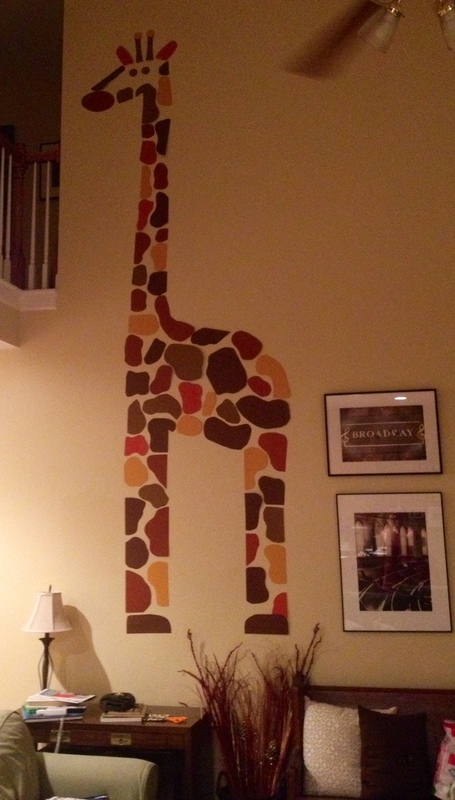 I actually had mine from when I was young and I repainted it… worked great. But you will need a mattress and a mattress pad. As for bedding… lots of people care about the bedding. I just wanted two crib sheets to rotate. Everything else is a choking hazard anyway. People will give you a THOUSAND blankets… just stay away from registering for them. Nice people will give you tons at showers, and they could make and pick out nicer blankets than you could register for anyway! bottles… at the beginning, babies need a slow flow, but then when they are about 6 months or older, they’ll need a faster flow. I would recommend THESE at the beginning, but then, I used all glass ones from then out. Not sure if you’re cool with these, you may just like plastic, but I loved them. 5 bottles is really all you need if you want to be minimalist. If you’re lazy, I’d recommend 8. For the faster flow bottles, you’ll need them around 8-10oz. Do not register for bibs. You’ll get a thousand unsolicited bibs. So… high chairs. Before we created our registry, a very generous friend of the family sent us the Svan chair, which is totally cool and will convert to a seat when your baby is bigger and can scoot up to the table. But it’s kind of expensive. I’ve also heard a lot of cool things about Boon Flair (I think more of a variety is out there but that link was on one of the two sites.). Otherwise, I know to stay away from cloth because it gets extremely dirty. For traveling and friends’ visits, we also own this easy strapping one that Minimalist Me thought would serve all purposes (which it probably would if we didn’t get the Svan). Depending on what infant carseat you get, you’ll want to purchase the same brand stroller so that the infant carseat can fit into the stroller, and then when the kid gets bigger, you can just use the stroller. These are called “travel systems” and you can look for them depending on what you want. I’d recommend sticking to one brand of carseats so you can just be used to the type of seatbelts… because they are confusing. Also, something that I want now that I wish I had is a lightweight collapsible stroller that is easy to carry and good for throwing in and out of the car for shopping, fairs, farmers markets, etc. THIS is a good, cheap stroller. Aquaphor… register for it… it’s amazing and expensive. It’s the cure-all… our pediatrician highly recommends it for everything: diaper rash, weird rashes anywhere, wrinkle cream for you. AMAZING. Itzbeen… AMAZING. We brought this with us to the hospital, and it’s a wonderful tool. I’m sure there’s an app that also does this, but this was great for caretakers to have so that they would know things also. pack n play I actually own a different one for traveling, but my mom has one very similar to this because she wanted a pack n play to have at her house for us, and I prefer hers. It has a changing table which is super helpful when you’re out traveling and you don’t have to pack your own changing pad. mirror for your car… I mean, it’s just helpful, especially for long trips. I’m sure I have forgotten something, but those are my big items. And, don’t worry… there is always a Target nearby, or Amazon Prime, which gets things to you super fast (free trials are totally worth it right after you have the baby!!). In the past week, I’ve had three separate conversations with newly-pregnant women who are worried about going back to work after having their baby. This is a very difficult thing to do, one that I received a lot of advice on from trusted friends who had also gone through it. Because of our health insurance conundrum, we had no choice but for me to go back to work or our family would be severely underinsured. (Hopefully that will change in the future!) Regardless of reason, it’s hard to go back to work after maternity leave. There were (and still are at times) many tears shed after drop-off. Here are a few things that I wanted to share, because I felt so alone and sad. My hope is that these tips will help others in the same situation. It doesn’t get easier, it just gets more normal. My girlfriend Misty told me this leading up to my first day of drop-off, and boy did that resonate with me. Just like people told me that having Maggie would “change us,” I didn’t really get why… but you just can’t really know until your kid is here. And you realize that a kid changes something for everyone but not in the same way. Once we established a routine, I felt worlds better, and I could feel the rhythm of our mornings. Talk to your child in the car and tell her about all the exciting things she gets to do at school that day. It seriously made me feel better than the drive of shame. Feel confident in the location that you are leaving your child. I could not leave Maggie in the mornings if not for the awesomeness of Ms. Sandy and Ms. Amy and all the other loving people that actually enjoy caring for her. Maggie is loved, cherished, treasured, and taught well while I am gone. I think her school is great. I would feel even worse had I not felt 110% confident in her school. Reward yourself for getting back in the car. The roughest part of the day is walking back to your car after you leave your child for the day. Oh man, that walk is the worst. What has helped tremendously is some kind of “reward” once you get inside… a book on tape (Tim Keller has been extremely comforting), a thermos full of coffee you don’t allow yourself to have until you get back in the car, and calling your mother or a friend. Distractions are key here. Sounds silly… but it works! Go to lunch with people, including your husband! Instead of wallowing in the misery of being apart from your child all day, take advantage of the time at work. Pay your bills at your breaks, visit with friends by meeting them for lunch, have coffee with your network… make the time at work feel like your “adult” time. This is also the best time to catch up and have dates with your husband! No need for a babysitter! Overall, this particular tip has been hugely helpful to my social side, especially when I felt guilty about taking time away from Maggie in the evenings and weekends when I wanted to see friends after work. Give yourself some slack. There’s going to be a day when you’re slightly relieved that you drop your child off… whether it is because you are excited about what is going on at work, or if you were just spit up on, or if you just need a second of silence. Why feel guilty for not feeling guilty? It’s a stupid potential cycle. Consider that day a gift of no guilt and know that days ahead may not be that easy. You’ll figure it out and make your own routine. Of course this is different for everyone, and what worked for me may not work for you. Obviously, I’d much rather be at home, so this may not be the standpoint of everyone dropping their child off in the mornings. But, I do wish I knew a little more about the process at the beginning… the first 6 months were quite rough. But it does get better. 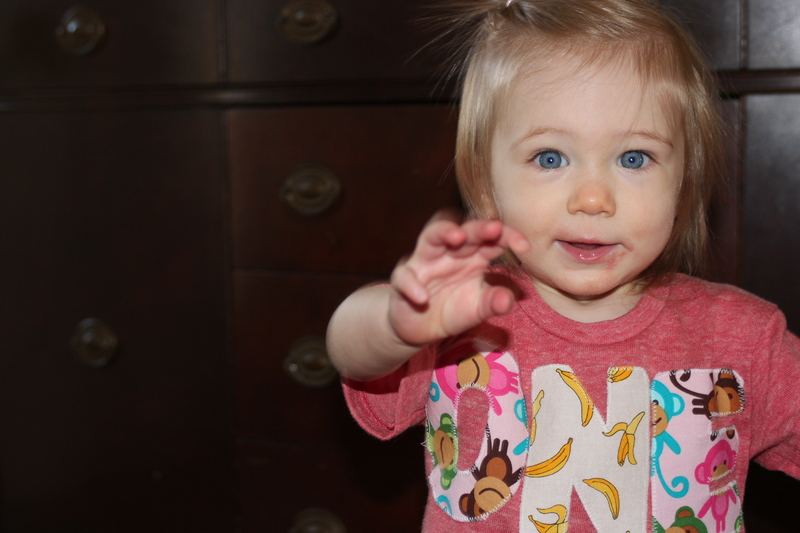 Throughout most of Maggie’s first year of life, I had this nagging feeling that Maggie’s first birthday party was supposed to be a huge deal: lots of friends, lots of decorations, lots of fuss. I had seen gorgeous pictures of other friends’ parties for their children, and I had started feeling the weight of making that happen for Maggie’s big day at the end of February. But, once Christmas came and went, I was feeling a little fatigue and began picturing the logistics of a large party. 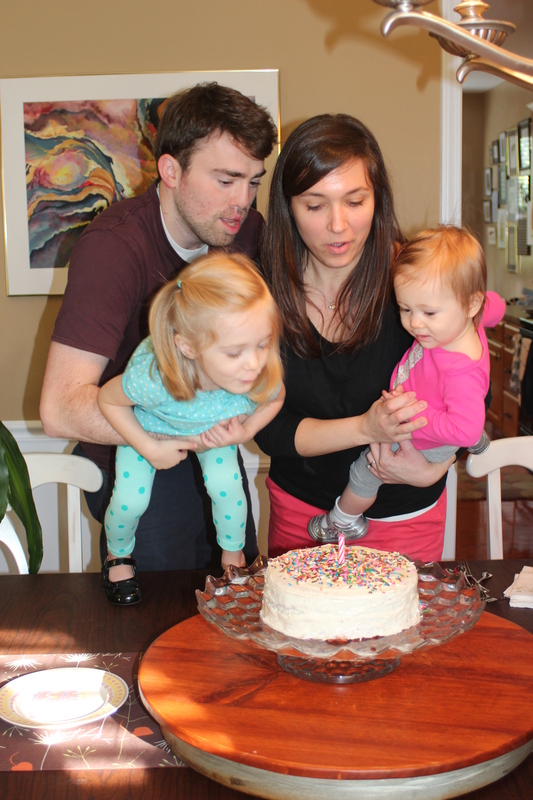 After considering everything and weighing my guilt (which I decided to work on in the Year 2013), we made an executive decision to have a very small party with just immediate family, and we all couldn’t be happier! Maggie especially… it was a fun afternoon of new toys, yummy BBQ, and delicious cake and desserts! 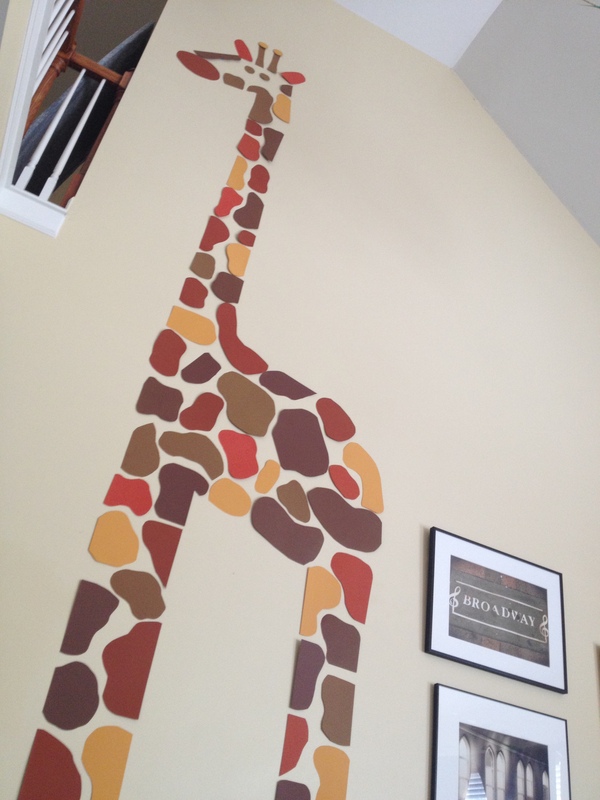 My original theme was to do a Monkey party (with a Pinterest board of inspiration and all! 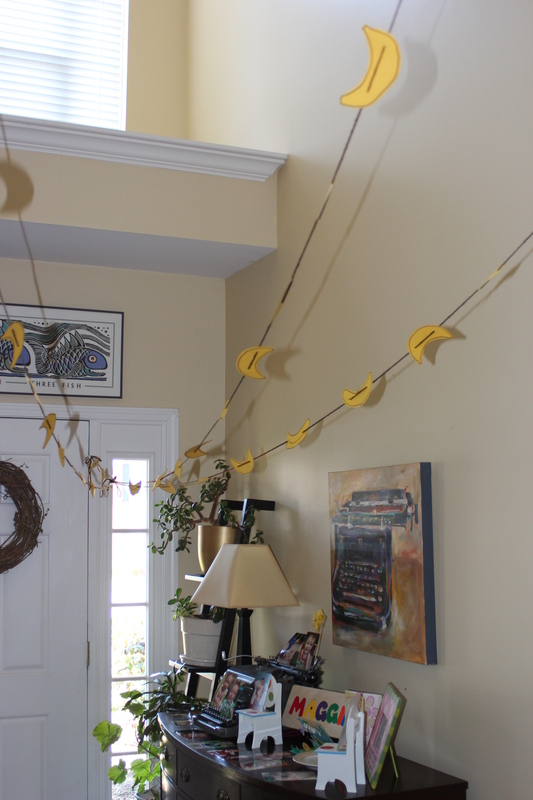 ), but I ended up doing only a banner of bananas plus a table full of pictures and other monkey items. We also had banana pudding (thanks to JD’s mom) and Monkey Bread. Best of all, we had a special cake made from an old college friend, Alex, from Sweet Betweens. 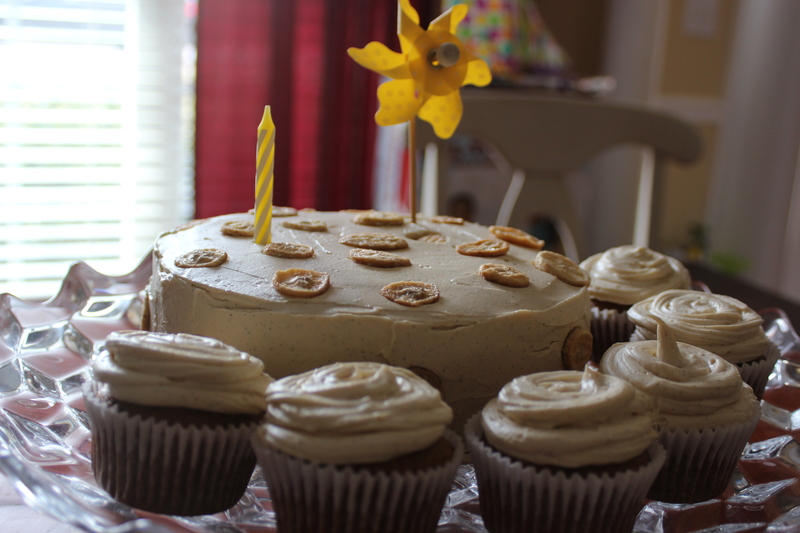 Maggie had her own banana cake, made especially for her sensitive baby stomach! Alex was awesome and did everything to accommodate our requests. And, Maggie LOVED her cake. 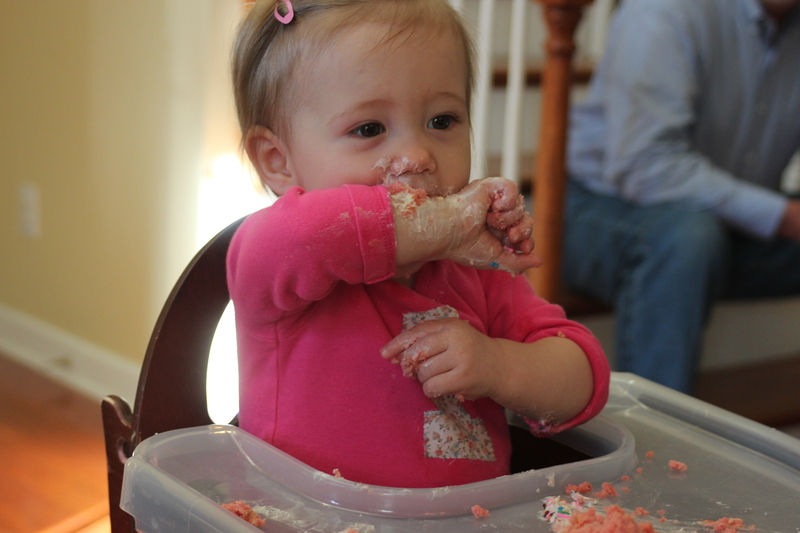 When presented with her very own cake, she delicately picked at it, but ate quite a bit over about a half an hour! 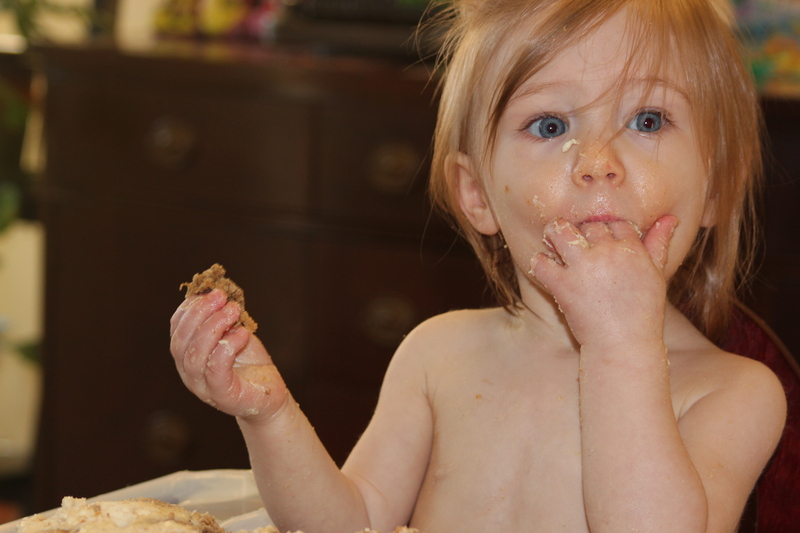 She enjoyed being somewhat clean with her eating, but we could tell she loved eating. It was so sweet, since we haven’t really given her much sugar at all since she started eating solid food. Overall, it was a wonderful day filled with our loving family around our favorite girl. 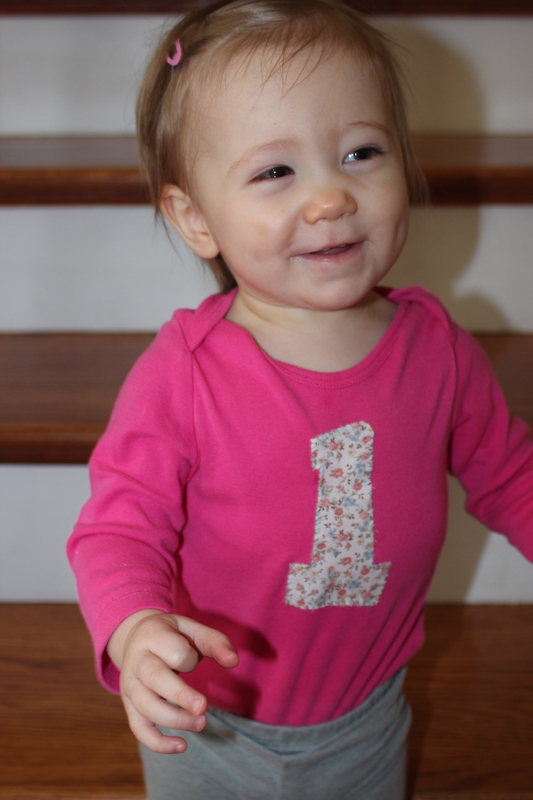 I’m so glad I didn’t let the crazy expectations of a big first birthday party get in the way of the fun. Maggie turned one year old today. 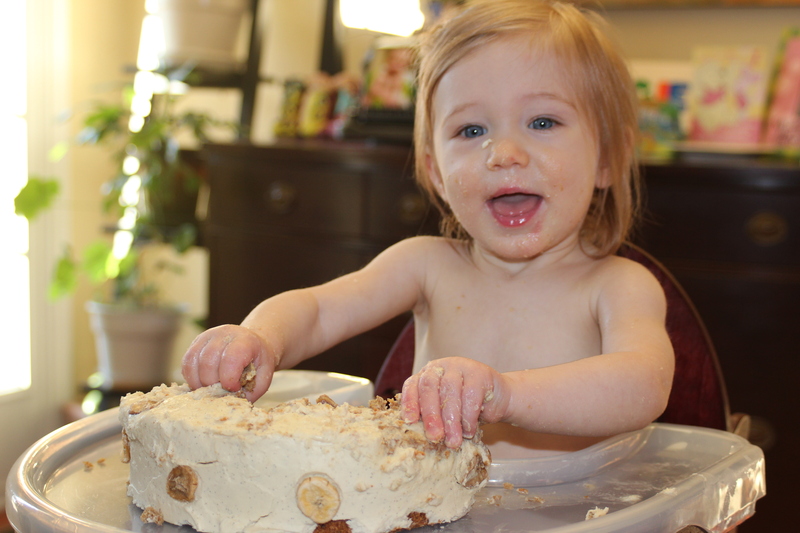 We had a very small gathering of just immediate family yesterday, and she was able to enjoy (immensely) a yummy cake. It was her very first bite of cake, and it was all hers! More to come about this low-stress, low-key, high-happiness event very soon.